On an otherwise normal July day in Strasbourg, a woman named Mrs. Troffea began slowly dancing in the street. The year was 1518. Over in England, Katharine of Aragon was pregnant with her last child by Henry VIII. In France, Anne Boleyn was at Queen Claude’s court. And over in Germany, Anna of Cleves was still just a toddler. Mrs. Troffea continued to dance that month of July 1518, and it became apparent that she was not going to stop. After about a week, over thirty more people joined Mrs. Troffea. Alarmed, priests and the religious community in and around Strasbourg were consulted. The officials and nobles must have been relieved to learn that the disease was likely not from supernatural causes, but they still wanted a solution and approached reputable physicians. These physicians determined that the common catch-all treatment for disease of bloodletting would not work on the dancers. The only possible cure? More dancing. The dancing obsession was attributed to the hot blood of the dancers, rather than an imbalance of humors. Because in medieval and renaissance medicine bloodletting only served to rebalance one’s humors, city officials believed that the dancers could be cured of their hot blood by eventually tire themselves out. To encourage the poor people suffering from dancing mania to wear out their disease, a stage was constructed in Strasbourg specifically to allow the dancers to continue. Professional musicians came, too. The number of dancers grew to over four hundred by August 1518. Most of the dancers were women, and the plague claimed up to fifteen victims per day. Victims died of exhaustion, heart attack, stroke, and other deadly causes resulting from the constant physical exertion. There is no official count of how many died, but it is thought that around four hundred people succumbed to the mysterious affliction. 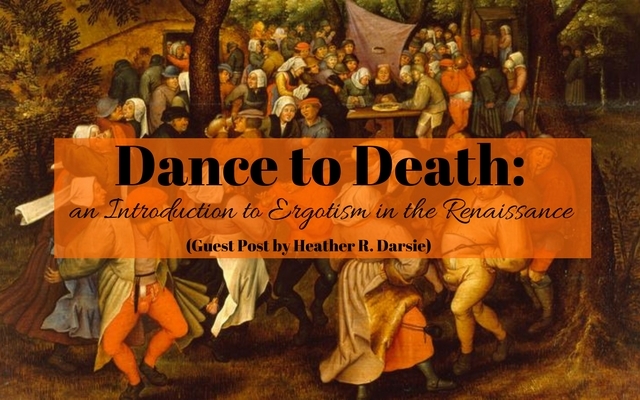 It is not known what caused the Dancing Plague of 1518, but a reasonable guess points to one of two forms of ergotism. Ergotism is caused by the consumption of rye infected with the ergot fungus. Infected rye was harvested, ground to make flour, then baked into bread. People would consume the infected bread, then become ill. Apothecaries occasionally used ergot in treatments during child birth, as well. Alkaloids in the ergot fungus contain lysergic acid, similar to that found in lysergic acid diethylamide (LSD). The main strands of the disease are first, the type known as St. Anthony’s Fire that causes gangrene and second, the type known as St. Vitus’ or St. John’s Dance, which causes convulsions and hallucinations. It should be noted that St. Vitus’ Dance is now more often associated with Sydenham chorea, and St. John’s Dance is now usually considered a form of apraxia, or nervous system disorder. The disease was called St. Anthony’s Fire because monks belonging to the Order of St. Anthony established hospitals in southern France, dedicated to treating the disease. Patients did sometimes recover from ergotism or lived longer when they visit one of the Order of St. Anthony’s hospitals, and so the saint became associated with the disease. St. Vitus of Sicily is the patron saint of dancing, so those suffering from the convulsive form of ergotism would pray to St. Vitus to end suffering. It was also thought that the dancing sickness was sent as some sort of curse or punishment from St. John the Baptist. Another possible saint associated with the disease is St. John of God, who died in 1550 and was canonized in 1690; St. John of God is the patron saint of hospitals. The late canonization of St. John of God would explain why the convulsive form of ergotism was known during the Renaissance as St. Vitus’ Dance, then evolved into being called St. John’s Dance. Interestingly, St. Anthony’s Fire, the ergotism that causes gangrene, was usually found west of the Rhine River whereas St. Vitus’ Dance more commonly appeared east of the Rhine River. It is likely that Mrs. Troffea and the other victims were suffering from St. Vitus’ Dance, and were convulsing or hallucinating whilst the disease took hold of them. The disease appeared as a major epidemic off and on from as early as the 14th century up through the 18th century. In around 1670, a French doctor noticed that ergotism usually appeared in poor rural areas, and also noted that the disease did not appear to be contagious like the Black Death or other infections. In the mid-1850s, another Frenchman, determined the life cycle of the ergot fungus. This discovery led to the ergot fungus becoming known as the cause of St. Anthony’s Fire and St. Vitus’/St. John’s Dance. Gilbert, Steven. “St. John’s Dance.” Updated 24 June 2016. http://www.toxipedia.org/display/toxipedia/St.+John%27s+Dance Accessed 26 April 2018. Lapinskas, Vincas. “A Brief History of Ergotism: from St. Anthony’s Fire and St. Vitus’ Dance until Today.” Medicinos Istorija. Vol. 13, No. 2 (2007). http://www.mtp.lt/files/MEDICINA-2007-2-16-LAPIN.pdf Accessed 12 April 2016. Waller, John. A Time to Dance, A Time to Die: The Extraordinary Story of the Dancing Plague of 1518. Thriplow: Icon Books (2008). Andrews, Evan. “What was the Dancing Plague of 1518?” History Stories. 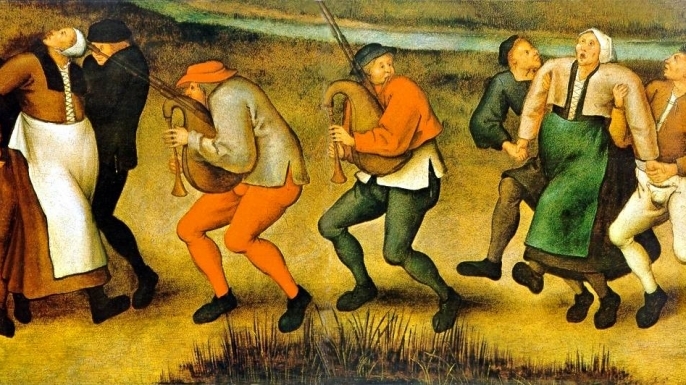 31 August 2015. https://www.history.com/news/ask-history/what-was-the-dancing-plague-of-1518 Accessed 26 April 2018. Heather R. Darsie lives in the United States with her family and three parrots. Heather is writing a new biography called Anna, Duchess of Cleves, which she hopes to submit to the publisher in late 2018. Heather is an apprentice bowyer, who also enjoys knitting. She holds a BA in German languages and literature, as well as Juris Doctorate. Would be very interested on reading anything on Anne of Cleves. We know so little before she came to England. I hope there is accurate picture of her. Why did the king find so ugly when her painting in my opinion shows her to be one of best looking. I know the definition changes throughout history but not that much. I just heard this as a question on a quiz show yesterday! I’d heard of it, but not the ergot connection. Bizarre, though, turning it into a party with musicians!